Editor of Sustainable Manufacturer Network, Kate Bachman, brings attention to the benefits of utilizing Calvary’s non-phosphate pretreatments. 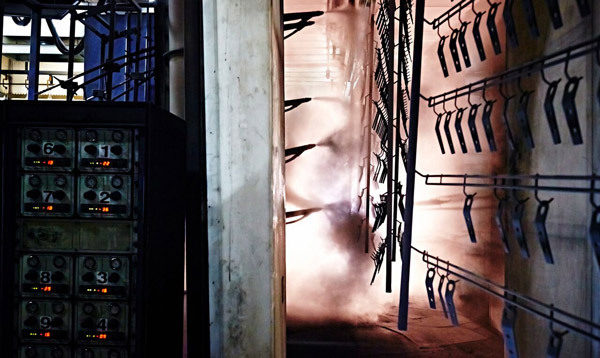 When Quality Industries’ 20-year-old pretreatment and powder coat system reached the point at which repairing it was too costly, the manufacturer replaced it with a new automated system that was greener, less waste-producing, and faster. Upgrading and greening its finishing process is part of Quality Industries’ strategy to become a world-class supplier. When Quality Industries’ heavily used pretreatment and powder coat system reached the point at which repairing it was too costly, the manufacturer replaced it with a new automated system that was faster, greener, and less waste-producing. “Simply put, the pretreatment and powder coating systems we began using 20 years ago had exhausted their useful life,” explained Ken Ham, vice president of engineering and technical services. Quality Industries management viewed the need for changes as an opportunity for environmental and productivity upgrades. It invested about $4 million in upgrades to both the cleaning chemicals used in the pretreatment process and the powder coating system, including the wash system, dryoff oven, cure oven, and powder coating delivery system. The new system was completed in August , 2015. The new pretreatment (wash) system included a new cleaner chemistry, changes to the wash stations, and lowered energy consumption. The new system was installed by Midwest Finishing Systems, the main integrator. Greener, Phosphate-free Chemistry. Quality Industries had been using a five-stage iron phosphate pretreatment system. In stage 1, an alkaline cleaner was applied, followed by a rinse in stage 2. The third stage was an iron phosphate treatment, with fluoride added to it to get a good edge on aluminum because both steel and aluminum go through the system at the same time. The fourth stage was another rinse, and fifth was a deionized rinse with a nonchromated sealer, said Chris Fann, senior vice president of operations. The company also used zinc phosphate cleaners in some operations. The company consulted with its chemical supplier, Calvary Industries, which advised it to switch from its phosphate-based cleaner to a zirconium-based pretreatment system–a more environmentally friendly bath chemistry. Phosphate dumping has been linked to the overgrowth of harmful algae blooms, such as the outbreak in the Toledo, Ohio region in 2014 that cut off the city’s potable water source for days. The more environmentally benign chemistry does not need any special hazardous waste removal, or special handling, as the phosphate pretreatment did. “Whenever the bath life is expired and has to be recharged, we can neutralize the chemistry and it can go directly into our sewer system,’” Fann said. Fewer Chemicals, Less Waste. Not only does the new pretreatment system come with improved chemistry quality, it also reduces the quantity of chemicals the manufacturer must use. The new automated system is equipped with monitors for all of the chemicals in the wash stages and replenishes the baths to the correct levels, continuously. Lower Temperatures; Less Energy Consumption. Substituting zirconium for the phosphate cleaners brought additional benefits in the form of reduced energy demand, Ham said. The iron phosphate had to be heated to be activated, but the zirconium is activated at ambient temperature, so the company was able to reduce its heating costs. Faster Processing. The payback on investment stems not only from buying fewer chemicals and less energy, but also from the productivity gains from the new process’s speed. “The old line ran about 8 ft. per minute; now we are able to run it at 18 FPM,” Ham said. More efficiencies await the metal components after they leave the pretreatment process and head into the powder coating booth. The manufacturer installed a new Nordson ColorMax® 2 powder coating system. Ham estimates that Quality Industries realizes a 20 percent improvement in raw material savings over the previous system because the new system has a more efficient application process and better powder reclamation (see Figure 1). Figure 1: Quality Industries new powder coating system applies the powder in a more targeted way. The guns adjust to the part being sprayed. Photo courtesy of Quality Industries. “The new system is significantly more efficient in how much powder we use and how much coverage we get. The powder booth is just one part of the investment, but it is where a lot of savings and quality improvements come from,” Ham said. Better Reclamation = Less Virgin Powder. The new powder coating system also reduces raw material usage because it is more efficient in reclaiming the powder. “It’s better technology–more efficient in recovering the reusable powder from the booth and respraying it over and over,” Fann said. “We do very little spray to waste,” Fann said. He added that most of the powder can be reclaimed and reutilized–recirculated and mixed back in with the virgin powder to be reused. The powder coat that does become waste must be hauled off as a special waste stream for disposal at a fee. Ham conceded that the company encountered “start-up issues” that come with any new system and a learning curve related to changes in how the parts are hung and handled, but anticipates being able to consolidate all of the work that had required a two-plus-shift operation to a one-shift operation. Higher First-time Quality Rate. As if the increased speed and decreased raw material waste were not enough, Ham said that the first-time quality rate has improved as well. “On the old line we were seeing a 20 to 25 percent part rejection rate, due mostly to equipment failures–the guns not acting properly, trash in the system, and so forth. The old system had a lot of rust inside the ovens and wash that could fall on parts and get stuck in the powder. Once we get a part on the new line and get a program written for that part, we are seeing excellent first-time-quality results.” The reject rate now is 5 percent or less under normal conditions. The company strives to reduce that reject rate even more, but the results are complicated by some of the complex shapes and geometries in the enclosures and extrusions, such as complex profiles with small valleys, ridges, and return flanges and small openings that require manual applications because of the nature of the powder coating process. In a powder coating system, electrical charges go through the hooks and the conveyor line that draw powder to the part, Ham explained. The static charge is what makes the powder stick to the part while it’s still in powder form. “The electrical enclosures we make for Schneider Electric have a box configuration with 90-degree angles and enclosed spaces. If you get an area that is confined, like in a corner, you’re basically getting the same effect of having two positive magnetic poles forcing the powder away from each other. So it repels rather than attracts the static charge. It’s called a Faraday cage effect. So the powder has to be manually applied,” he said. As to the $3.7 million price tag, Ham said that the investment decision wasn’t a “straight-up business case” based on ROI alone. It is part of Quality Industries CEO and President Warren Hayslip’s long-range vision for the company as a world-class supplier. Quality Industries declares its commitment to protecting the environment and the safety of its employees front and center on its website: “Quality Industries is dedicated to continually improving its environmental, health and safety compliance policies and procedures. We avoid hazardous processes involving heavily chlorinated solvents and heavy metal pretreatments. The investment decision is future-leaning. “It was investing in one of our core competencies for future growth. It was a strategic investment. Being able to provide complete finishing services to its major customers like Schneider Electric, Paccar, Miller Industries, and a solar energy company is mission critical.” (see Figure 2). Figure 2: Upgrading and greening its finishing process is part of Quality Industries’ strategy to become a world-class supplier to its major customers. Quality Industries has grown into an integrated contract manufacturer with $100 million-plus annual sales. It provides engineering services, component parts, subassemblies, and finished products.